St Mark’s Manor is a 21-suite housing facility, which provides low income senior citizens with affordable and pleasant accommodations. It is located close to a bus line, grocery store and a public library. From time to time, there are vacancies. Suitable candidates are over 65, capable of taking care of themselves in all respects, making a low monthly income, and looking to live in a friendly community type environment. A good reference from your previous landlord is also required. Please contact the Rentals Manager listed on the contact page, if you, or someone you know, fit these qualifications and are in need of this type of accommodation. St Mark’s Manor is operated and managed by the St Mark’s Building Society, a non-profit volunteer organization. 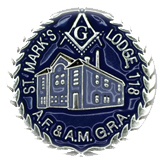 The building society board is made up exclusively of St Mark’s Masonic Lodge members. However, a Resident Manager is employed to oversee the day-to-day operation and management of the building and surrounding property.